What an amazing day! The food is fantastic and the bar is top notch! Karen makes every little detail happen in the smoothest fashion! Karen and her staff were wonderful throughout the entire process! The outdoor wedding venue was exactly what we were looking for, making for beautiful lasting memories. The food was delicious and delivered to each table with efficiency. Eagle Vale was a wonderful wedding and reception facility! I got married at Eagle Vale in August and it was AMAZING! Karen and her staff were so accommodating! They answered all of my questions, calmed any concerns I had about the reception and were so great about making recommendations to make my day even more special. Mu husband and I truly felt like VIPs on our wedding day! THANK YOU KAREN AND ALL OF THE EAGLE VALE STAFF! My husband and I looked around for a few different venues before finally deciding on Eagle Vale to host our reception in December 2016. Karen was the reason we chose the location. She is incredible to work with! She goes above and beyond for you and your guests and is always around to answer questions of any sort! The night of our wedding, my husband and I were blown away by the transformation in the room. Eagle Vale became our very own winter wonderland. I could not be happier with the entire experience from start to finish. It was beyond our expectations. Our guests cannot stop talking about the amount of fun they had and the entire experience. How more couples don't choose this spot is beyond me. You want a wedding reception in a room that flows perfectly, with a staff that works with you, food that is great, space to move around easily, and a coordinator who knows exactly what they are doing then you need to book your wedding here! We had an amazing time working with Karen and Eagle Vale. From the moment we walked in and met Karen, we knew this is where we wanted to have our ceremony and reception. She is super fun and easy to work with, and she took a lot of the stress off of us. We were able to have the wedding we wanted, and all of our guests raved about the food and the atmosphere. We definitely recommend Eagle Vale to anyone looking to have a wonderful wedding! I had my wedding at Eagle Vale last September 2015 and we had a wonderful experience. Karen and her staff did such a beautiful job putting everything together the way we had imagined. What I liked about Eagle Vale was the amount of space they had to accommodate our very large guest list. The space is nice crisp and clean like an empty canvas, we were able to transform that room into what we wanted using decorations and uplighting. The food was pretty good, the Filet Mignon melted in your mouth... we had a lot of compliments on the food. Another big bonus to this venue was no noise ordinance, so we were able to dance and have a good time without shutting down the party too early. Choosing Eagle Vale for our wedding venue was one of the best decisions we made for our wedding. Our wedding was September of 2015 and we had an outdoor ceremony there, followed by a reception in the ballroom and it was beautiful! Karen was a joy to work with from start to finish. She was always there to answer any questions, offer suggestions and make the planning easy for me. We had many compliments on the food and the venue and would choose Eagle Vale over and over again! I had my wedding at Eagle Vale this summer 8/23/14 and it was everything I imagined it would be!! The venue is stunning and I felt like I was walking into a fairy tale when I entered my reception!! I had a very positive experience working with Karen. She is very personable, responsive, accommodating, and seemed generally interested in making sure my wedding would go well. During my engagement year, Eagle Vale changed chefs, after we had already done our tasting for choosing our dinner selections. This change concerned us, as we were not sure what the new chef was like. Karen suggested that we have a second tasting to try out our dinner selections for our wedding with the new chef. It was even better the second time around!! So many of our guests were raving about the food! It was delicious and I wish I could eat it all over again!! The staff at Eagle Vale were helpful and attentive. Karen remained at my reception through all of the major events, which I appreciated. I will say that much of the correspondence for planning my wedding went through my mother, but my mother and I frequently commented on how grateful we were to be working with Karen! Thank you so much for helping to make my day so perfect!! Eagle Vale was the perfect venue! Karen and the rest of the staff was wonderful to work with throughout the entire process. They worked with us on a few things that we wanted to do that were a little out of the norm (I surprised my husband by renting a pool table for the reception). The food was excellent. People are still commenting to us about the food and it was a week ago. We just wish we hadn’t been so preoccupied with socialized and had eaten more of the appetizers. Also, even though the ballroom is large and can accommodate a few hundred people, it was perfect for our 100 guests. The layout never made it feel too big, but actually gave it a nice flow for those who wanted to dance, sit and chat, hang out around the bar, and/or play pool. I would definitely recommend Eagle Vale! I absolutely loved having our wedding at EagleVale! It is so beautiful there, the food is great and Karen was amazing. I don't know what I would have done without her help!! Highly recommend EagleVale as a wedding venue, everything was perfect. If you are looking for a venue that can accommodate a large number of guests, or a venue that doesn't feel small this place is perfect! Their food was amazing. All the guests raved about the large portions and the quality. Karen was easy to work with and didn't let anything go unnoticed. Service and responsiveness to all of our needs far exceeded our expectations! Karen was extremely responsive throughout the planning and execution of the wedding. She was wonderful to work with. Eagle Vale was a great venue for our October 26th wedding and reception. Karen was great to work with. The food was excellent! It was a served dinner that was served very hot and tasted exactly like our tasting. We had lots of compliments. 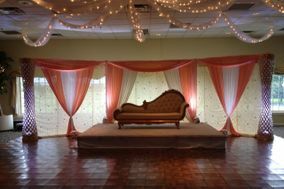 The dance floor is beautifully decorated with lights overhead and my bridesmaids and I enjoyed the bridal room. Highly recommend! We heard from some of the guests at the wedding that the bartender was not always at the bar and some had to go downstairs to get their drinks. Hello there. I am the coordinator for the weddings and I think what happened was that the bar closes during introductions through dinner. Some guests still looking for beverages are directed to the downstairs bar that is open for wedding guests during this time. Thank you for the review and I will be sure to post signs on the bar from this point on so the guests know the itinerary for the evenings events. Cake topper was thrown away by the wedding coordinator. My bridesmaid had her WALLET STOLEN from the bridal suite. During our cake cutting there was:No Plate,No Forks,No Napkins for the bride and groom. Guest did not recieve a fork to eat their cake with as well. During dinner I was approached by the wedding coordinator to discuss billing of an additional unexpected vendors dinner. My guest only had negative comments about the PRIME RIB: overly fatty, chewy, and inconsistent in proportion and size. Guest asked for more coffee and were told to "drink decaf because we aren't making any more." Eagle Vale failed to provid the experience we were looking for, especially given its reputation. My husband and I felt more like guests than a Bride and Groom.